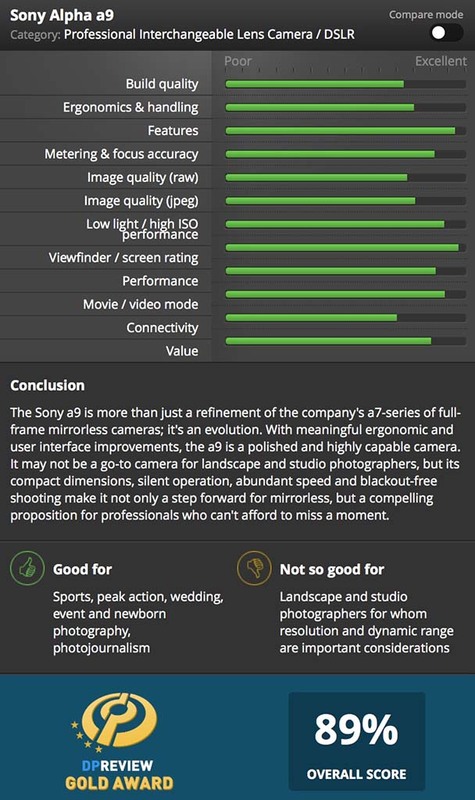 The Sony a9 took home a gold award just like the GFX, even though DPReview had a critical opinion piece about the camera that stirred up a lot of controversies, which was also similar to the GFX. DPReview is developing a bit of a pattern here. There is also no mention of the overheating issues, which some have experienced. The Sony a9 isn’t a camera for everyone, but I am disappointed that DPReview didn’t address the potential quality control issue that led to the overheating controversy. They let someone write a big opinion piece about nothing and then completely ignore an issue that will affect potential purchasers. Poor quality control is something that everyone should be aware of and blog/sites that are simply trying to sell cameras over trying to provide consumers with valuable purchasing information should be called out. The Sony a9 is a great camera, but you might have to exchange your camera a few times during the 30 day exchange period in order to find a properly functioning camera. Hopefully, quality control will get better as time goes on, but Sony really needs to get on top of this, because I am still coming across reports of people with “new” overheating cameras.